EDMONTON, Canada (September 28, 2018) – The first season of the highly popular World Boxing Super Series’ (WBSS) super middleweight division concludes today (Friday, Sept. 28), when World Boxing Association (WBA) super middleweight world champion “Saint” George Groves takes on undefeated challenger Callum “Mundo” Smith, airing live from Jeddah, Saudi Arabia, starting at 2 p.m. ET / 11 a.m. PT, exclusively on Super Channel in Canada. 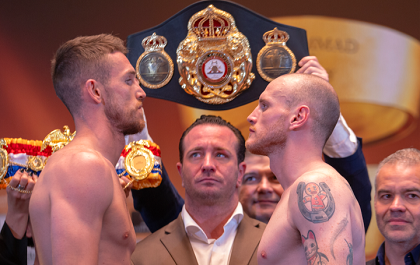 Groves vs. Smith, presented by Sauerland Event, was postponed from its originally planned June 2 date due to Groves’ shoulder surgery from an injury he suffered in his February17thWBSS semifinals 12-round unanimous decision victory against Chris Eubank, Jr. The fight is nearly like an online slot game about to pay out, as it is only hours away. 1 Response to "WBSS Championship Final Super Middleweight Division: George Groves vs. Callum Smith"
I was delighted to find this web site. I wanted to thank you for your time reading this wonderful! I really enjoyed every bit of it and I’ve marked to ensure that the blog post something new. It is really fantastic. keep sharing with us such nice posts.